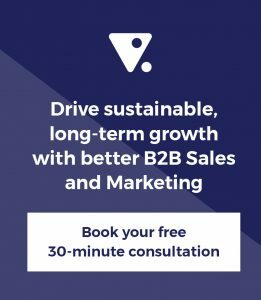 I’ve managed outsourced marketing for hundreds of businesses – and operated as the outsourced group Chief Marketing Officer for many of them. So, I have got a pretty good handle on what works and what doesn’t. Today, let me give you a really short summary of what I’ve learned should be outsourced – and when. The answer’s not complicated, but it does need to evolve as your business evolves. Until you’re earning about a million dollars’ worth of recurring revenue – with some sort of predictability – you’re in what I call scrappy start-up mode. What should you outsource at that point? The answer is: nothing. Keep every cent in-house. Find just one tactic, and master that. Once you’ve got that one tactic – maybe it’s AdWords or SEO – working well enough that it’s looking after itself, then and only then should you add a second tactic. When that second tactic, again, is kind of looking after itself, then add a third. This is key, particularly if your core skill is not marketing – but also, frankly, even if it is. Once you’ve reached $1 million or $2 million of revenue, you’ve proven there’s a market for your product and that you’re a worthy product for that market. This is what we like to call ‘product-market fit’. Marc Andreessen from Andreessen Horowitz first coined the term, and I think it works well. When you’ve gotten to this point, you need more and better capability. You need to be wider and deeper in your marketing. That’s when you should outsource your marketing to a single multi-service agency. You’re still too small to have multiple agencies. You won’t know how to select them, you won’t be able to manage them, and the time it will take will kill you. You want a single marketing partner that can take on the lot. This agency might be one person who looks after you and three other companies, or a larger company who looks after multiple clients and has a little bit more depth. Essentially, you want a single marketing partner that can take on all of your tactics – those you’ve got going now and the others that you’ll add. While these revenue figures aren’t hard laws, they are good guidelines. So, once you’ve gotten your revenue to about $10 million, it’s time to reassess your needs and possibly add one or two specialist partners who can go deeper on one or two of the tactics you’re using. If you want to make this transition smoothly, do it with your outsourced partner – not in spite of them. For example, if you’re using a tactic that they are just not quite deep enough on, work with them to find somebody who is. You may ultimately take on the new specialist under your current partner, or separately. But what you don’t want to do is sour the relationship with the partner who’s doing most of your work, and has done a good job for you as you’ve grown. Once you get to around $20 million, it’s time to look at bringing some, or all of that marketing in-house. So, you’re going to hire one or two in-house marketers. If there’s a couple of them, or even three of them, one of them is going to be the lead. Hire somebody who’s capable of really stepping up. Now, I still suggest you outsource a few areas. One of those would definitely be: mentoring your own in-house team. You want to put a high priority on growing your marketers. Maybe you’re the wrong person to do that. Or maybe you’re the right person but you just don’t have the time. The solution? Hire a mentor for those marketers to help them to grow. So, what have you got now? In addition to your in-house team, you still have your initial partner plus a couple of specialist agencies. At this point, I’d be hanging on to the specialist agencies – but thinking about whether the generalist partner who’s served you so well to this point is needed – and in what role. Though you may have brought core responsibilities in house, your original partner might serve admirably as mentor – as backstop – or to fill in particular gaps. Yes, it could be time to part ways. But it’s just as likely that the knowledge and expertise in your business that they’ve gained over your time together will be valuable to you going forward. For $50 million and above, the answer is pretty much the same. But now the question now is: what do you outsource? Specialist agencies – while your own people may be doing most of the ‘doing’ work, deeply-skilled specialists will almost certainly still be needed. Recruitment and talent acquisition – very few companies do that well in-house. 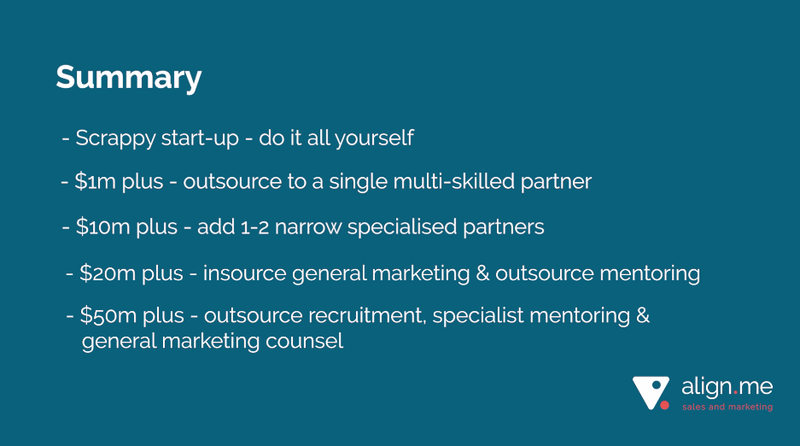 Specialist mentors for each of the specialist skills inside your team – outside experts can keep them growing for you. Possibly, some kind of general marketing counsel to you and to the board – to help you manage the marketing function. Whether you’re the sub-million-dollar scrappy start-up or you’re over $50 million, you need all of those parties I spoke about to understand the grand plan. I often talk about sales and marketing alignment. But really, the need for alignment is much broader. What about all those agencies that you work with? The recruitment companies? They all need to be on board too. 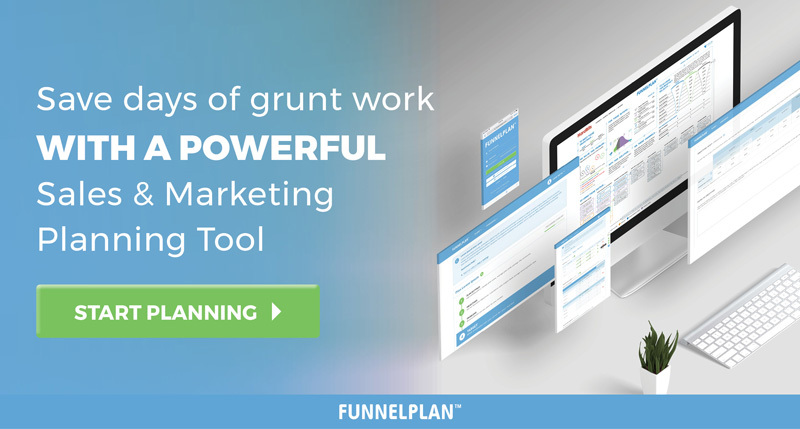 And that’s the job of Funnel Plan – to help you build those answers together and then communicate those answers to all of those partners so they understand the greater vision. If you have a Funnel Plan already, you know what I’m talking about. If you don’t, go to Funnelplan.com and grab yourself a Funnel Plan.